The Southwest Mountains as seen from Graduate Charlottesville. All photos by Daniel Schwartz. 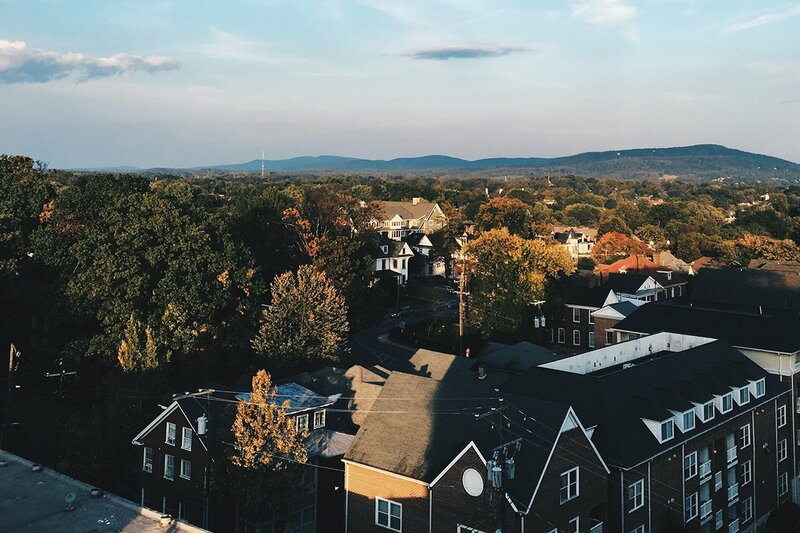 After a whirlwind weekend of historic house visits, day drinking, and farm-to-table dinners in Charlottesville, Virginia, Fathom's Daniel Schwartz learns that not all small college towns are created equal. 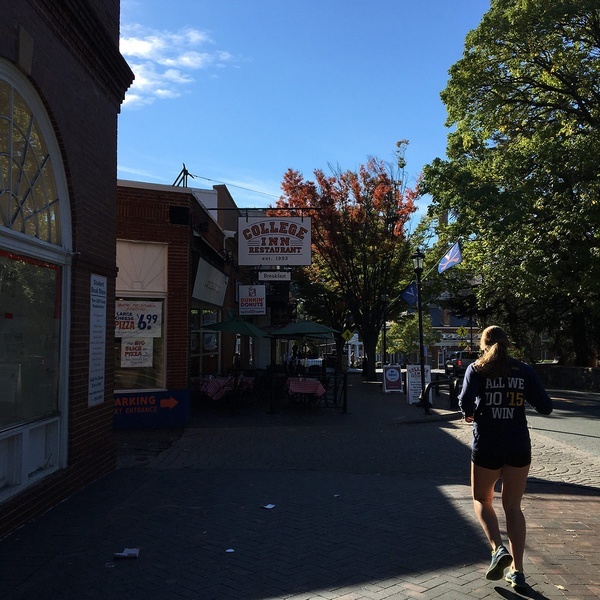 CHARLOTTESVILLE, Virginia – Charlottesville, a small city situated around the University of Virginia, broke my bias against college towns. (For the record, I went to college in the small town of New York City.) After a long weekend, I learned that the city is not the under-serviced strip of wild watering holes that I'd feared, but rather a balanced, charming, small town with Southern sensibilities, a rich, palpable history, and enough post-collegiate recreation to warrant a return trip. This is a university town, so let's start with a brief geography and history lesson. 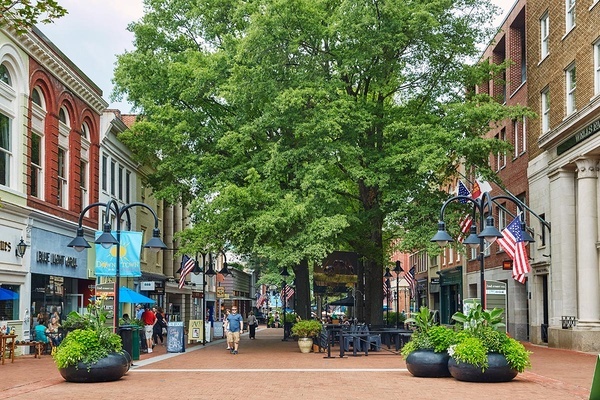 Charlottesville is located at the base of the Southwest Mountains of central Virginia, a range that runs parallel to the eastern edge of the Blue Ridge Mountains, an hour and a half drive west from the state capital, Richmond. The city was founded in 1762 on Three Notched Road, a major colonial trading route that connected Richmond in the east with Shenandoah Valley in the west. Today, the short strip that cuts runs through the center of town has become Main Street. The pedestrian Downtown Mall, full of quirky shops and adult drinking and dining, branches off the eastern edge of Main. 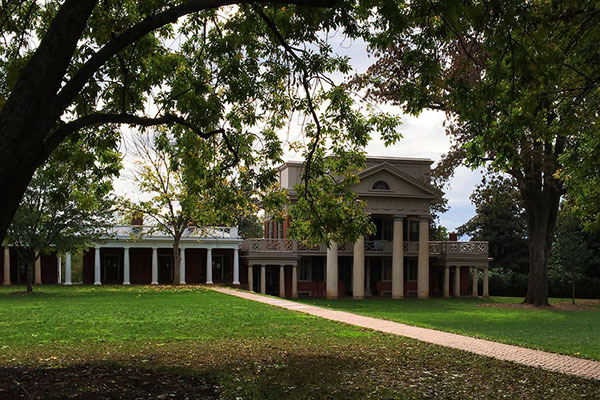 University of Virginia, founded and designed by Thomas Jefferson in 1819 and considered one of the better public universities in the country, starts on the other edge. The Corner, a seven-block district of college bars and restaurants, begins at this western extreme. I was here as a guest of Graduate Charlottesville, a new, locally inspired hotel that borders The Corner in front of the university. The first things I noticed were ubiquitous southern-style white porches, many happy hand-holders (Charlottesville is the spot for weddings in Virginia), and strong school spirit. Cars peacock with bumper stickers displaying a crossed sabers underneath a bright orange V, the logo of the Virginia Cavaliers, NCAA Division I. Restaurants, mostly in The Corner, have window labels indicating that students can eat now and pay later under the university honor code, one of the oldest in the nation. Runners, of which there are many, weave through town at all hours and in all weather conditions, a blaze of oversized college colors. Downtown Mall. Photo by Christian Horan. A pavilion on The Lawn at University of Virginia. Runners out in The Corner. Even on early Saturday mornings. To understand the school obsession, I started early on a weekend morning and walked the grounds (locals don't call it a campus) of the University of Virginia, an UNESCO World Heritage Site, an architectural achievement, and one of the first religiously independent schools in early America. It also, for reasons our guide couldn't explain, recently became home to a sizable chunk of the Berlin Wall. Daily history tours meet at Harrison Institute (in front of the Wall) and wind by gardens to The Lawn, a green patch framed on two sides by ten pavilions, the original grounds, where 54 carefully selected high-performing senior students live. The Pantheon-inspired Rotunda currently under renovation caps the lawn to the north. The open southern end once looked at farmland (a symbol of Jeffersonian agrarian ideals), but now faces class halls and libraries, many marked with symbols of secret societies. Ask your guide about their workings. My favorite, The Seven, is the most secretive and only reveals the identity of members when they die in a ceremony involving black roses and off-key bells. 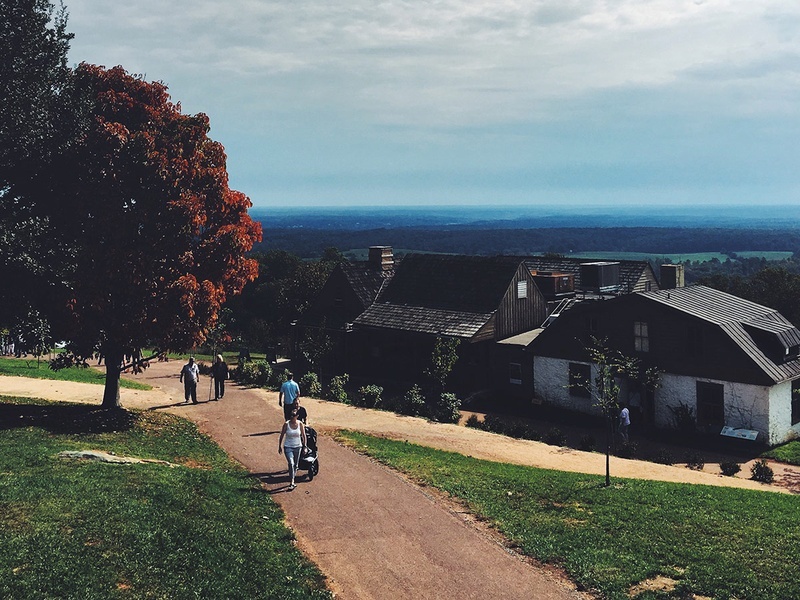 Monticello, the former hilltop home of Thomas Jefferson, is worth visiting for perspective on the contradictory life of the former president and for the beautiful farm and garden surroundings. The Behind the Scenes House Tour weaves through rooms filled with original and replicated books, homewares, and design quirks — alcove beds, double-pane windows, mechanically closing doors. Captivating guides tell the story of a broke man with many possessions who held noble ideals of liberty, yet owned 600 slaves during his lifetime. Also of particular interest were stories about old farming techniques and James Hemmings, the enslaved French-trained chef de cuisine. Ash Lawn-Highland, a smaller presidential cabin stuffed with period pieces adjacent to Monticello, tells the story of another president, James Monroe. Both houses are only fifteen minutes from the city, but it might be too much to do both in one day. Presidential buffs immune to museum fatigue can visit both and add Montpelier, the scenic estate of James Madison, 45 minutes out of town. The view from Monticello. The Jefferson family once farmed most of the land in sight. One museum was enough for me, so I was happy to head to strong>Carter Mountain Orchard, ten minutes from Monticello, for apple and peach picking and great picnic views of the Blue Ridge Mountains. Their Bold Rock Hard Cider Cellar serves a tasty IPA and the gift shop sells just-baked apple cider donuts. Families in flannel, decorative gourds, and country music completed the fall feel during my October visit. The southern edge of Shenandoah National Park is twenty miles west of Charlottesville. A great route would be to enter the park at Rockfish Gap off interstate 64 and cruise the only public road in the park, Skyline Drive, a 105-mile north-south mountain road with striking overlooks, campgrounds, and hiking trails. Dark Hallow Falls trail, a short but steep route to a waterfall, is a particularly excellent endorphine rush. The ultimate trail to conquer is nine-mile Old Rag Mountain trail, the longest, most challenging trail in the park. 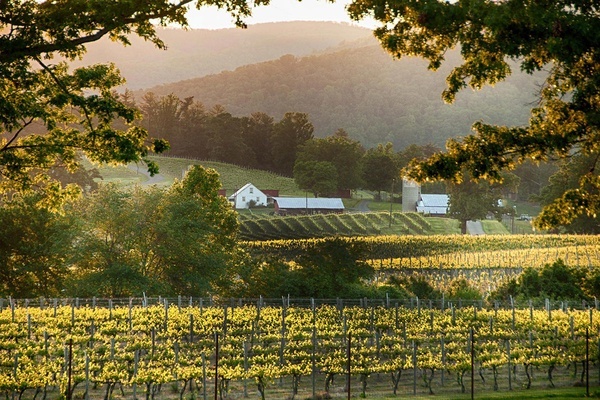 Charlottesville and the surrounding area has more than 60 wineries, ten microbreweries, and a handful of cideries. For beer, I stayed in the city. Really, where else did I need to go? 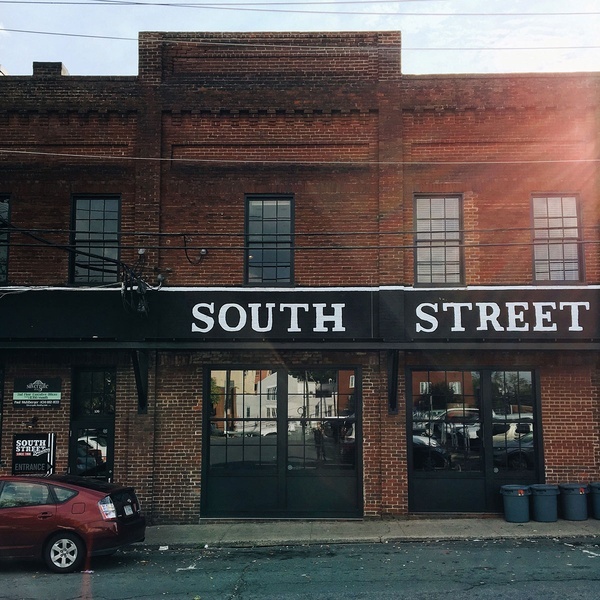 South Street Brewery has twelve beers on tap, Three Notch'd Brewing Company pours funky flavors, and Champion Brewing Company entertains crowds with seasonal beers and rotating food trucks. For wine, I left town to hit the wineries. (All in the name of thorough Fathom research, friends.) A word on the wine front: Some are small, simple operations, so plan your wild tour carefully with this handy wine map. Afton Mountain Vineyards and Veritas Vineyards are two neighboring wineries with good grapes and great views of the hazy Blue Mountains. Grace Estate Winery hosts live music, local food trucks, and games of corn hole on Friday nights. I weathered a thunderstorm in their tasting room, tapped my feet to live bluegrass with a monster platter of pulled pork, ribs, mac 'n' cheese, and mustard-based potato salad from Smoked BBQ Co. Outside, the pitch black and howling wind was humbling. Inside, the energy was electric. But the best place to wine and dine the day away may be Pippin Hill Farm and Vineyard, a farm-to-table restaurant on a sustainable vineyard (reputed to be the best wedding venue in the area). The plan should be to arrive early (the winery fills up quick), start drinking, and order in excess. I ordered the Buffalo Creek grass-fed beef sliders, Virginia country ham croque monsieur, and winter squash cappelletti with guanciale and fennel pollen. If a wedding hadn't closed the kitchen early, I would have spent the day in the dining room in the barn overlooking the vast farmland and run through the rest of the menu. The tasting room in the distance. Photo courtesy of Grace Estate Winery. The lunch spread at Pippin Hill. If mornings are short, a scuffin (a muffin and scone hybrid as delicious as you're imagining) and nitrogen-chilled La Colombe cold brew from Sheepdog Cafe at Graduate should get the day cranking, as would bacon, egg, and cheese on New York-style bagel at Bodo's Bagels, a Charlottesville favorite. (Dear bagel fanatic from New York, please appreciate the good effort and be nice to these Southerners. It's hard to replicate perfection.) When the hangover is strong, the cure is to brunch big on heavy plates at Pigeon Hole, a college hotspot also has late-night weekend hours. Because the best hangover cure is really the pre-cure: two biscuits soaked in red-eye gravy at two in the morning. Keeping lunch light provides mental clarity for history tours, hiking, and marathon day drinking. That means a picnic of sweet potato biscuits with country ham and prosciutto deviled eggs from Feast! Or Southern-inspired salad bowls from Roots Natural Kitchen, a healthy take-out joint breaking up the burgers and beer of The Corner. Those who consider bacon a vegetable, should stick with burnt ends, spare ribs, and buttermilk fried chicken at Ace Biscuit and Barbecue, a local favorite. There's no need to hold back for dinner. Wait times can be long, but options are plentiful. And chances are, what they're serving wasn't grown too far away. Continental Divide is known as the restaurant with the "Get In Here" sign for good reason: The beloved, dimly lit drinking den has top-notch southwestern-style Mexican food. Tavola, a no-reservations Italian joint in the revitalized Belmont district, serves huge portions of house-made pasta and a local menu of meats and cheeses. If the wait is too long, The Local next door is a reliable backup. C&O Restaurant overlooks a tract of railway that connects the Chesapeake region with Ohio and does fine dining with six distinct dining spaces. The upstairs dining room serves New American dishes on white tablecloths (like a damn good baked and fried local trout), the bistro is charmingly European, and the gallery is for private events (a.k.a. wedding receptions). Nearby, chef Ian Boden, a James Beard Award semifinalist for Best Chef in the Mid-Atlantic, regularly rotates dishes according to the seasons at his recently opened Glass Haus Kitchen. Yeah, yeah, yeah. Let's unbuckle the belt and get back into culinary vice. Sweethaus, a mom 'n' pop cupcake shop in a shipping container with a new location in Williamsburg, Brooklyn, is open until midnight on weekends. Then there's Crozet Pizza at Buddhist Biker Bar, which has one of the better slices you'll find after midnight in Albermarle County. Benny Deluca's, a Virginia chain with pizza pies that can't fit horizontally through doorways, should only be patronized after a few too many drinks. Good beer in brick buildings. A common theme. After such heavy dinners, I wanted to end the evening early. But I resisted the -itis, and experienced what I came to love most about Charlotesville — live bluegrass, well-made drinks, and the seductive twang of inebriated southern accents. It's a cocktail that roots a wanderer in both time and space. It's two hours to midnight below the Mason Dixon line, and the night just started. Post-baccalaureate nightlife is concentrated around Downtown Mall. World of Beer is broadcasting the game. The Southern Cafe and Music Hall hosts ticketed gigs. Bang, located in an old townhouse, has outdoor seating, girls-night-out people watching, and many a martini, several of which like the Snoop and the Pantydropper, may offend the old-fashioned. 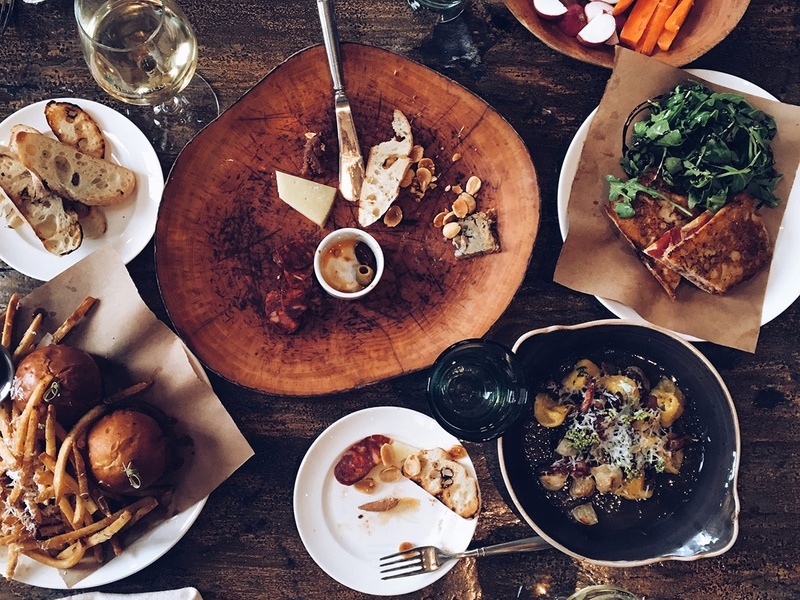 Locally sourced Southern food, an impressive selection of more than 125 whiskeys, and live music draw crowds to The Whiskey Jar, a reclaimed-wood bar and restaurant (whose chef is also a farmer) with a rowdy, elbow-to-elbow atmosphere. LW's Livery Stable down the street is chilled out with an interesting lineup of patrons: lumberjack-looking regulars, families, punks. Library Bar has a drinks menu of 64 cocktails divided into eight sections, with recipes from bars across the country, including New York's PDT. The Alley Light is how you end a good night: The hidden bar down a dark alleyway serves craft cocktails in beautiful glassware and upscale midnight snacks to boozed-up patrons on leather sofas. Those who haven't graduated from college bars (no judgments!) will love Boylan Heights, a popular option among the go-hard-or-go-home UVA crowd. Twenty TVs, organic burgers, local brews, and loud dance music explain why there's a line out the door every night. Lodging in central Charlottesville is dominated by chain hotels and B&Bs. Exceptions include Boars Head, a four-diamond resort two miles out of town; Inn at Darden, the on-grounds business school hotel; and Graduate Charlottesville, a well-curated, 134-room hotel with boutique feel, where I stayed. 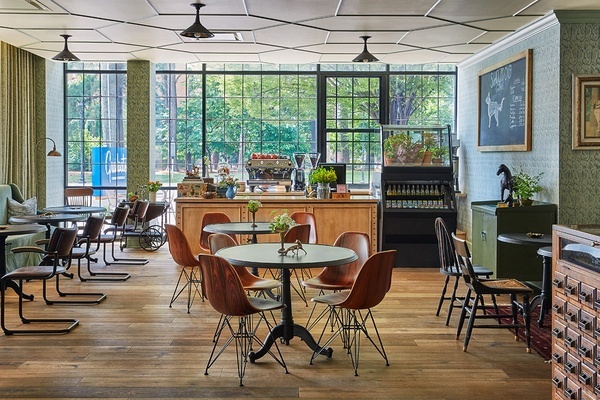 The recent addition to Graduate Hotels, a new line of hotels by AJ Capital Partners opening in vibrant college towns across the country, is walking distance from University of Virginia, The Corner, and Downtown Mall. Rooms start at $129. The beds are unbelievably soft. 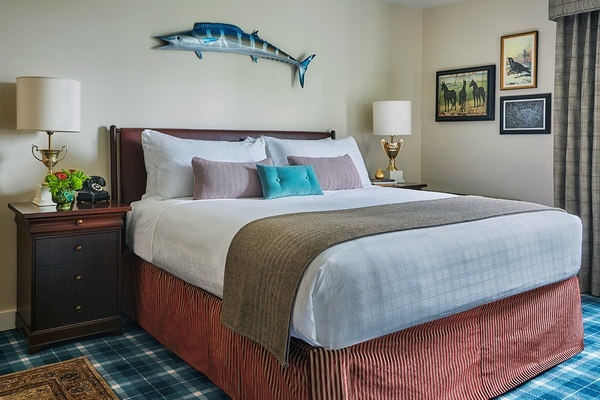 Interiors are elegantly preppy, and in-room decor pays homage to local heritage — Colonial silhouettes of alumni, Jefferson family portraits, and a wall-mounted wahoo (a prize game fish) referencing the local nickname for UVA students and sports teams. ("Wahoowa!" is the school's adorable rallying cry.) 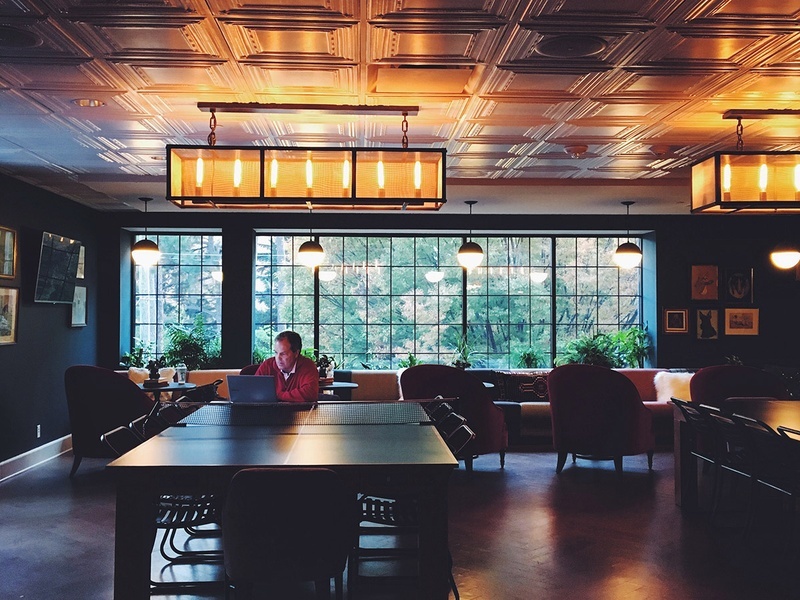 Free WiFi, quality coffee from Sheepdog, and a rooftop restaurant and bar (opening soon) attract students and locals alike. The front desk knows the neighborhood, and was very helpful with recommendations. Like most people in town, they greet guests at every opportunity. The second floor gaming and reading area at Graduate Charlottesville. Sheepdog Cafe at Graduate. Photo by Christian Horan. A bedroom at Graduate. Note the wahoo. Photo by Christian Horan. Domestic visitors can fly to Charlottesville-Albermarle Airport (CHO). For international travelers, or those looking for a cheaper ticket, Richmond International Airport (RIC) is an hour and a half by car from town. Amtrack and Greyhound have stations on Main Street. Although most city attractions are accessible by foot, a car is necessary for hiking, house visits, and winery tours. Bikes, free for guests at Graduate, are a pleasant way to get around. A free trolley runs until just before midnight and makes a loop around the center of town. Here's the map. Late spring is peak season, whentemperatures are balmy, families flock into town for graduation, and wine festivals are in full swing. Mid-autumn is the other time to visit, with perfect weather for hiking, apple picking, and touring. Plan ahead: October is homecoming and wedding season, and hotels fill up fast. Winters are freezing and summers are quiet, hot, and muggy.